1536 - Portuguese explorer Pedro a Campos visits the island. 1627 - Captain Henry Powell lands a party of English settlers who establish a colony, which they then develop as a sugar plantation economy using slaves brought in from Africa. 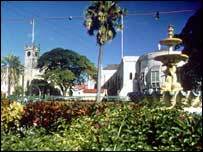 1639 - Barbados's first parliament, the House of Assembly, holds its first meeting. 1663 - Barbados is made into an English crown possession. 1816 - Slaves stage a revolt. 1876 - British proposal for a confederation of Barbados and the Windward Islands triggers bloody riots in Barbados. 1937 - Outbreak of riots in response to poor economic conditions; British Royal Commission sent in to investigate conditions; Barbados Labour Party (BLP) founded by Grantley Adams. 1951 - Universal adult suffrage introduced; BLP wins general elections. 1954 - Ministerial government set up with Grantley Adams as premier. 1955 - Democratic Labour Party (DLP) formed out of a splinter of the BLP. 1958-62 - Barbados a member of the British-sponsored Federation of the West Indies, of which Grantley Adams became the first prime minister. 1961 - Barbados granted full internal self-government with DLP leader Errol Barrow as premier. 1966 - Barbados becomes independent with Barrow as prime minister. 1967 - Barbados joins the United Nations. 1972 - Barbados establishes relations with Cuba. 1976 - BLP, led by Tom Adams, the son of Grantley Adams, returns to power after winning the first general elections since 1961. 1983 - Barbados supports and provides a base for the US invasion of Grenada. 1985 - Adams dies and is replaced by Bernard St John (BLP) as prime minister. 1986 - Errol Barrow becomes prime minister after his DLP wins the general elections. 1987 - Erskine Lloyd Sandiford (DLP) becomes prime minister following the death of Barrow. 1994 - Owen Arthur becomes prime minister after his BLP wins a decisive victory in the general elections, securing 19 of the 28 seats in the House of Assembly, the lower chamber of parliament. 1999 - BLP wins a landslide in the general elections, capturing 26 of the 28 seats in the House of Assembly. 2002 - Barbados is removed from the Organisation for Economic Cooperation and Development (OECD) list of countries deemed to be uncooperative tax havens. The country was put on the list in 2000. 2003 May - BLP wins 23 of 30 seats in general elections; Owen Arthur returned for third term. 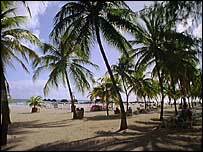 2004 February - Sea border disagreement with Trinidad and Tobago flares after arrest of Barbadian fishermen. Barbados takes border case to UN-backed tribunal. 2008 January - Parliamentary elections won by opposition Democratic Labour Party. David Thompson becomes prime minister. 2008 July - Launch of bid for offshore oil exploration leads to row with Venezuela over demarcation of maritime border. 2009 March - PM David Thompson survives no-confidence vote brought over his handling of financial crisis precipitated by collapse of Trinidad-based insurance company Clico - the region's biggest casualty of global financial crisis. 2010 October - Prime Minister Thompson dies in office. 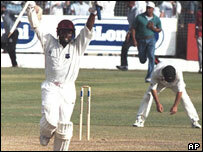 Freundel Stuart becomes PM.